We live today in a complex world of manmade structures and machines. We work in buildings which may be many storeys high and travel in cars and ships, trains and planes; we build huge bridges and concrete dams and send mammoth rockets into space. Such is our confidence in the modern engineer that we take these manmade structures for granted. We assume that the bridge will not collapse under the weight of the car and that the wings will not fall away from the aircraft. We are confident that the engineer has assessed the stresses within these structures and has built in sufficient strength to meet all eventualities. This attitude of mind is a tribute to the competence and reliability of the modern engineer. However, the commonly held belief that the engineer has been able to calculate mathematically the stresses within the complex structures is generally ill-founded. When he is dealing with familiar design problems and following conventional practice, the engineer draws on past experience in assessing the strength that must be built into a structure. A competent civil engineer, for example, has little difficulty in selecting the size of steel girder that he needs to support a wall. When he departs from conventional practice, however, and is called upon to design unfamiliar structures or to use new materials or techniques, the engineer can no longer depend upon past experience. The mathematical analysis of the stresses in complex components may not, in some cases, be a practical proposition owing to the high cost of computer time involved. If the engineer has no other way of assessing stresses except by recourse to the nearest standard shape and hence analytical solution available, he builds in greater strength than he judges to be necessary (i.e. he incorporates a factor of safety) in the hope of ensuring that the component will not fail in practice. Inevitably, this means unnecessary weight, size and cost, not only in the component itself but also in the other members of the structure which are associated with it. 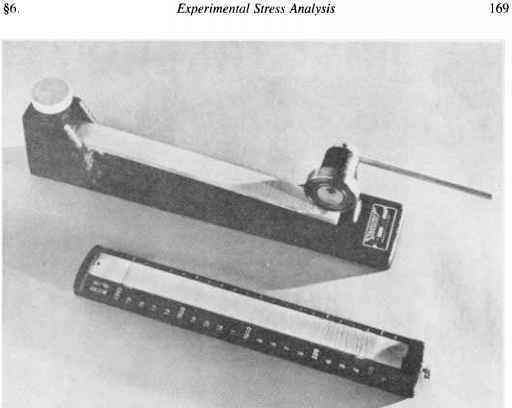 To overcome this situation the modern engineer makes use of experimental techniques of stress measurement and analysis. Some of these consist of "reassurance" testing of completed structures which have been designed and built on the basis of existing analytical knowledge and past experience: others make use of scale models to predict the stresses, often before final designs have been completed. Over the past few years these experimental stress analysis or strain measurement techniques have served an increasingly important role in aiding designers to produce not only efficient but economic designs. In some cases substantial reductions in weight and easier manufacturing processes have been achieved. The brittle-lacquer technique of experimental stress analysis relies on the failure by cracking of a layer of a brittle coating which has been applied to the surface under investigation. The coating is normally sprayed onto the surface and allowed to air- or heat-cure to attain its brittle properties. When the component is loaded, this coating will crack as its so-called threshold strain or strain sensitivity is exceeded. A typical crack pattern obtained on an engineering component is shown in Fig. 6.1. Cracking occurs where the strain is greatest, so that an immediate indication is given of the presence of stress concentrations. The cracks also indicate the directions of maximum strain at these points since they are always aligned at right angles to the direction of the maximum principal tensile strain. The method is thus of great value in determining the optimum positions in which to place strain gauges (see §6.2) in order to record accurately the measurements of strain in these directions. 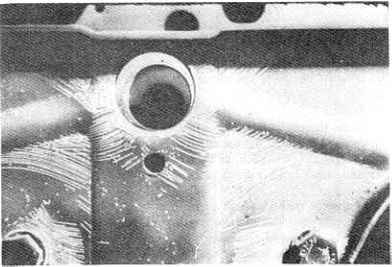 The brittle-coating technique was first used successfully in 1932 by Dietrich and Lehr in Germany despite the fact that references relating to observation of the phenomenon can be traced back to Clarke's investigations of tubular bridges in 1850. The most important advance in brittle-lacquer technology, however, came in the United States in 1937-41 when Ellis, De Forrest and Stern produced a series of lacquers known as "Stresscoat" which, in a modified form, remain widely used in the world today. There are many every-day examples of brittle coatings which can be readily observed by the reader to exhibit cracks indicating local yielding when the strain is sufficiently large, e.g. cellulose, vitreous or enamel finishes. Cellulose paints, in fact, are used by some engineering companies as a brittle lacquer on rubber models where the strains are quite large. As an interesting experiment, try spraying a comb with several thin coats of hair-spray lacquer, giving each layer an opportunity to dry before application of the next coat. Finally, allow the whole coating several hours to fully cure; cracks should then become visible when the comb is bent between your fingers. In engineering applications a little more care is necessary in the preparation of the component and application of the lacquer, but the technique remains a relatively simple and hence attractive one. The surface of the component should be relatively smooth and clean, standard solvents being used to remove all traces of grease and dirt. The lacquer can then be applied, the actual application procedure depending on the type of lacquer used. Most lacquers may be sprayed or painted onto the surface, spraying being generally more favoured since this produces a more uniform thickness of coating and allows a greater control of the thickness. Other lacquers, for example, are in wax or powder form and require pre-heating of the component surface in order that the lacquer will melt and run over the surface. Optimum coating thicknesses depend on the lacquer used but are generally of the order of 1 mm. In order to determine the strain sensitivity of the lacquer, and hence to achieve an approximate idea of the strains existing in the component, it is necessary to coat calibration bars at the same time and in exactly the same manner as the specimen itself. These bars are normally simple rectangular bars which fit into the calibration jig shown in Fig. 6.2 to form a simple cantilever with an offset cam at the end producing a known strain distribution along the cantilever length. When the lacquer on the bar is fully cured, the lever on the cam is moved forward to depress the end of the bar by a known amount, and the position at which the cracking of the lacquer begins gives the strain sensitivity when compared with the marked strain scale. This enables quantitative measurements of strain levels to be made on the components under test since if, for example, the calibration sensitivity is shown to be 800 microstrain (strain x 10~6), then the strain at the point on the component at which cracks first appear is also 800 microstrain. This type of quantitative measurement is generally accurate to no better than 10-20%, and brittle-lacquer techniques are normally used to locate the positions of stress maxima, the actual values then being determined by subsequent strain-gauge testing. Loading is normally applied to the component in increments, held for a few minutes and released to zero prior to application of the next increment; the time interval between increments should be several times greater than that of the loading cycle. With this procedure creep effects in the lacquer, where strain in the lacquer changes at constant load, are completely overcome. After each load application, cracks should be sought and, when located, encircled and identified with the load at that stage using a chinagraph pencil. This enables an accurate record of the development of strain throughout the component to be built up. Given good conditions, however, and a uniform base colour, cracks are often visible without any artificial aid, viewing the surface from various angles generally proving sufficient. 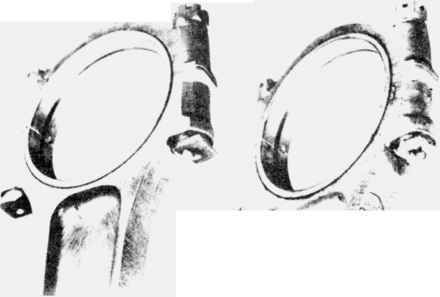 Figures 6.3 and 6.4 show further examples of brittle-lacquer crack patterns on typical engineering components. The procedure is simple, quick and relatively inexpensive; it can be carried out by relatively untrained personnel, and immediate qualitative information, such as positions of stress concentration, is provided on the most complicated shapes. Fig. 6.3. 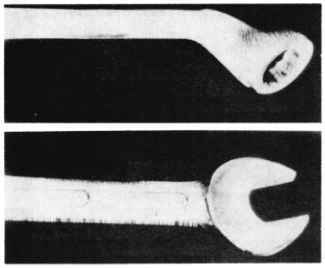 Brittle-lacquer crack patterns on an open-ended spanner and a ring spanner. In the former the cracks appear at right angles to the maximum bending' stress in the edge of the spanner whilst in the ring spanner the presence of torsion produces an inclination of the principal stress and hence of the cracks in the lacquer. Various types of lacquer are available, including a special ceramic lacquer which is particularly useful for investigation under adverse environmental conditions such as in the presence of water, oil or heavy vibration. Refinements to the general technique allow the study of residual stresses, compressive stress fields, dynamic situations, plastic yielding and miniature components with little increased difficulty. For a full treatment of these and other applications, the reader is referred to ref. 3.
where AR and AL are the changes in resistance and length respectively and K is termed the gauge factor. A L/L e where s is the strain. The value of the gauge factor is always supplied by the manufacturer and can be checked using simple calibration procedures if required. Typical values of K for most conventional gauges lie in the region of 2 to 2.2, and most modern strain-gauge instruments allow the value of K to be set accordingly, thus enabling strain values to be recorded directly. In the simplest half-bridge wiring system, gauge 1 is the active gauge, i.e. that actually being strained. Gauge 2 is so-called dummy gauge which is bonded to an unstrained piece of metal similar to that being strained, its purpose being to cancel out any resistance change in R] that occurs due to temperature fluctuations in the vicinity of the gauges. Gauges 1 and 2 then represent the working half of the network - hence the name "half-bridge" system - and gauges 3 and 4 are standard resistors built into the instrument. 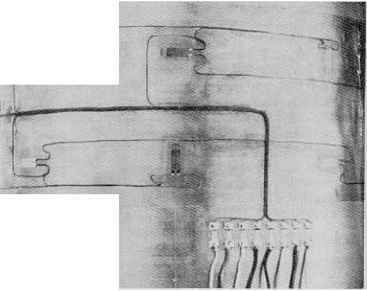 Alternative wiring systems utilise one (quarter-bridge) or all four (full-bridge) of the bridge resistance arms. 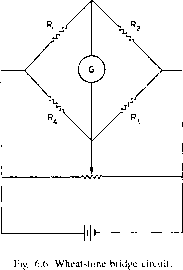 With the Wheatstone bridge initially balanced to zero any strain on gauge R\ will cause the galvanometer needle to deflect. This deflection can be calibrated to read strain, as noted above, by including in the circuit an arrangement whereby gauge-factor adjustment can be achieved. Strain readings are therefore taken with the pointer off the zero position and the bridge is thus unbalanced. An alternative measurement procedure makes use of a variable resistance in one arm of the bridge to cancel any deflection of the galvanometer needle. This adjustment can then be calibrated directly as strain and readings are therefore taken with the pointer on zero, i.e. in the balanced position.